The Thai New Year, ‘Songkran’ originally derived from Sanskrit, “astrological passage”, “move” or “change place”. It is the day the sun changes its position to Aries in the zodiac. The date of the Songkran festival also known as the ‘water festival’ used to be set by astrological calculation, but these days Songkran is a fixed date. Songkran is celebrated every year from April 13 to April 15, in reality the Songkran Festival does not finish until the 19th of April. 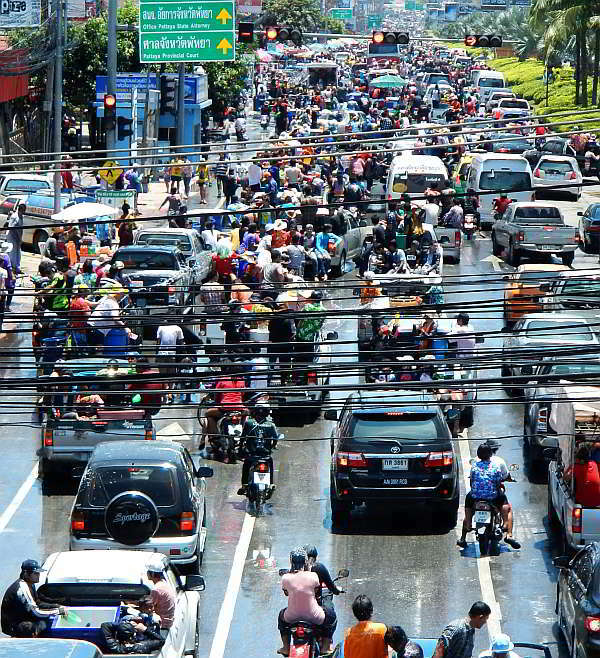 To avoid total chaos and allow people time to make the journey home the festival is staggered regionally, so Bangkok might celebrate Songkran on the 13th, but the official Songkran day in Pattaya is the 19th . April 13 is Maha Songkran Day or the day that marks the end of the old year, April 14 is Wan Nao which is the day after and April 15 is Wan Thaloeng Sok which is the beginning of the New Year. Songkran is celebrated by all people in Thailand regardless of religion. Originally, the water for Songkran was used to clean the Buddhas, it was captured and then used, sometimes scented with herbs to bless the people (usually the elders) and wash away any bad luck, by sprinkling it over the shoulders. Chalk is used to make a runny paste which is spread on the cheeks, this act is called “Din Saw Phong”, you should ask consent before applying this as it is considered bad manners if you don’t. The chalk is used to mimic the chalk which monks use to mark blessings. 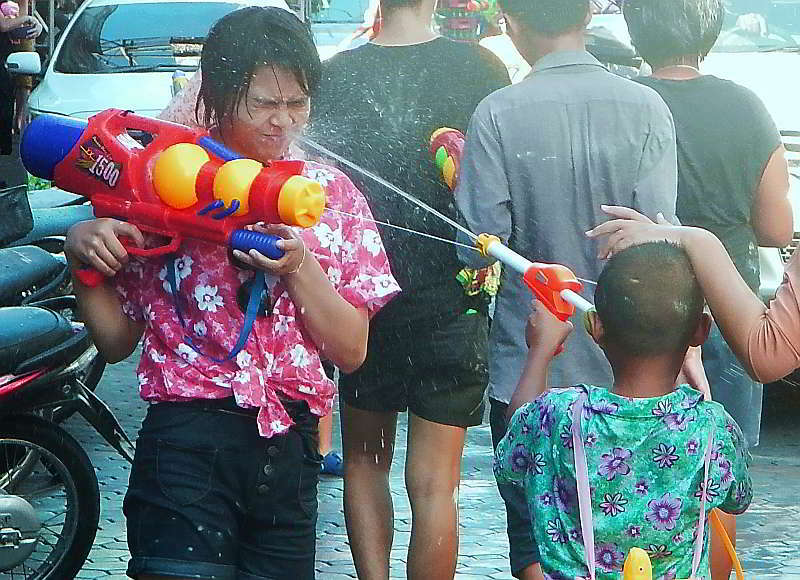 In true Thai tradition some fun had to be gained from Songkran, and April being the hottest time of year as well, the younger generations turned the occasion into unceremonious drenchings and water fights. These days there is no holding back during Songkran and no one is spared, if you go outside you get wet. songkran is a happy time in Thailand, this is the time for the Thais to let their hair down and party, and party they do. The roads and streets will be lined with people armed with water pistols, buckets, or anything which can propel water. Truck after truck loaded with Songkran revelers slowly pass by, each one loaded up with large containers of water ready to throw back at the people on the roadside. More often than not the traffic will come to a complete standstill during the Songkran festivities, even the major highways will come to a grinding halt. Drinking adds to the party spirit and probably plays it’s part in the high mortality rate during the Songkran festivities, many accidents occur due to water being thrown, often very hard in the faces of passing motorcyclists. Quite often ice will also be added to the water to add to the shock effect. Calls have been made in recent years to calm down the over boisterous Songkran festivities due to concerns over the high mortality rate. 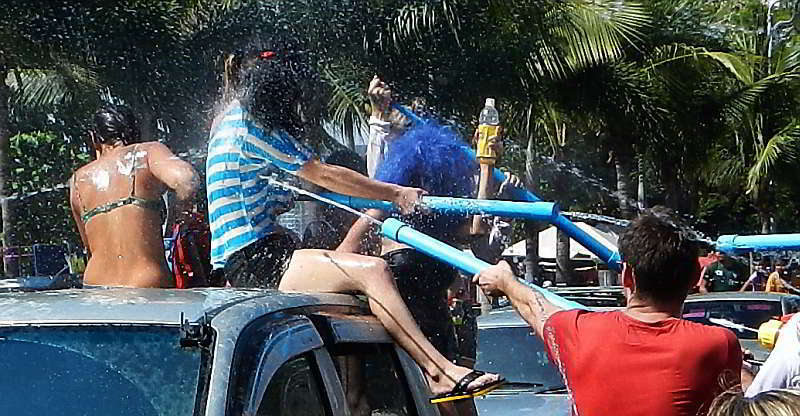 Participating in the Songkran Festival can be great fun (see photos below), after all, this is the biggest water fight in the world, but things do get out of hand. People do overstep the mark, if you want to participate in the Songkran Festival read the Ultimate Songkran Survivors Guide first. Water water everywhere. Thailand’s Songkran Festival. Songkran fstivities on Sukhumvit Highway, Pattaya.